Got her fired up and drove her around a little!!! The timing's not perfect but it starts right up and runs/idles well. Now to figure out those blasted turn signals. I've got the wire diagram but I can figure out which wire supplies the juice from the picture but plan to pick up a volt meeter and start checking wires. There's a little barrel looking fitting under the dash where two wires from the turn signal switch plug in. Could that be burned out? I'm not sure what it's called but maybe it makes the clicking sound when the signals are engaged? Flasher unit is the little barrel; It could be bad. Any advice on fine tuning the timing? I'm having a hard time reading the scale on the side of the engine block to get it to the 6 degrees below TDC. When I use a timing light to shoot the harmonic balancer I see 4 marks on the side of the pulley but I'm not sure where to line it up. Also my carb seems a little gummed up. Sometimes after accelerating it doesn't come right back down to a soft idle. Also sometimes it sputters a bit before shutting off. 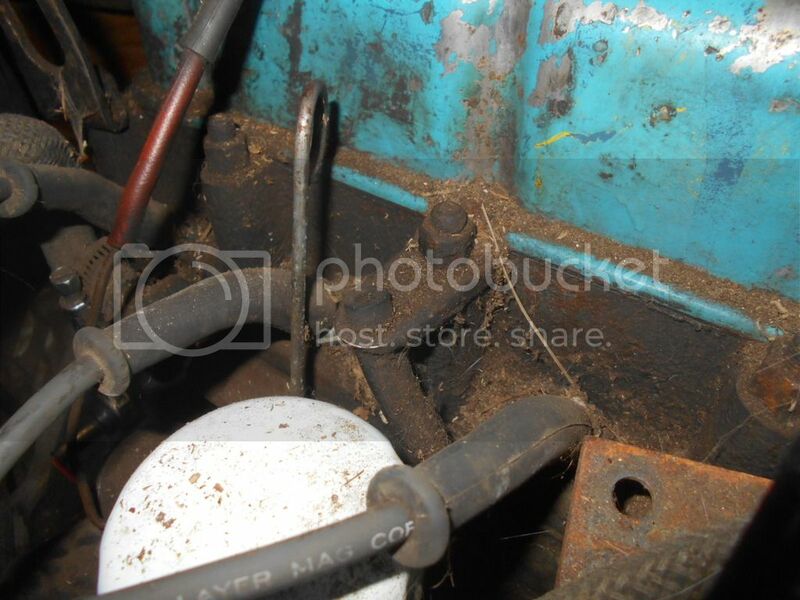 Are there rebuild kits for the 320 carb or is it something that a local carb shop should be able to rebuild? Any idea what that might cost? Last question... Down next to the oil dip stick there's a little vent tube that come up from the side of the motor. Should there be be a piece of tubing attached to that and if so where should it go? Find a rebuild kit BEFORE you take yours apart, I went thru this with carb re-builders, they cannot get the kits and I had to give them one of my kits, I had 2 rebuilt, and I had to give them a gasket kit the first rebuild, and the second rebuild I had to supply a complete kit, the first one they used their needle and seat and that one don't work so good. It took a long time to get that first one rebuilt, as they brought in several kits before they gave up and said they could not get one and then I sent them mine. MLP Carburetors in Australia is where I bought my complete rebuild kits, I bought every kit they had, but that was several years ago, also Deerio I believe bought my last gasket kit and had a bunch of gasket kits made, maybe he still has some left, you would have to contact him yourself about that. Unless your looking to keep it completely stock, buy a Weber, it has more power and one can get parts for them, and it is likely cheaper. Wayne's right, I had some copies laser cut by some guy I found locally. I sold a few and gave a few away so I'll have to check if I have more. Shoot me a PM to remind me. I personally check timing while standing in front of the radiator and pointing the timing light pretty much from right above the balancer, but the belt gets in the way a little bit. Thanks Deerio! I'm excited to go back out and fine tune the timing a little more. Also, it's a little slow to start when it's cold, could that be a sign it's a little advanced? Turn signals working!!!! Used a test light to find the juice and traced it to a faulty female bullet terminal. Cut and spliced in a new terminal and boom! Hopefully I now won't be the victim of road rage by driving a car without signals. But I can't figure out the horn. It honks continuously. One thing I don't see or understand is what the horn button presses to ground out the circuit. Maybe my steering wheel is missing something? Also, there's a little tube that pops up next to the dipstick with a barbed end. It's just sitting there open but maybe it needs a hose attached that vents it up somewhere? Any ideas? Take a photo of the tube your talking about and post it, I have a 62 and I don't have a clue about what you are talking about. If the vacuum advance tube was cut off it could be in that area, is it a very small copper tube? It's definitely not the vacuum advance. Looks like it might be a vent? The vacuum advance goes from the distributor to the carb, right? I think my copper vac advance hose goes into the carb by plugging into a rubber hose. Does that sound right? I have a J15 also, and I found that tube, it comes from the dipstick tube and goes up to a bracket coming off my middle head bolt, a rubber hose goes from that tube to the bracket, it appears to be a vent tube although why it is pointed straight up is a mystery to me. Could it be problematic if I just leave it alone? 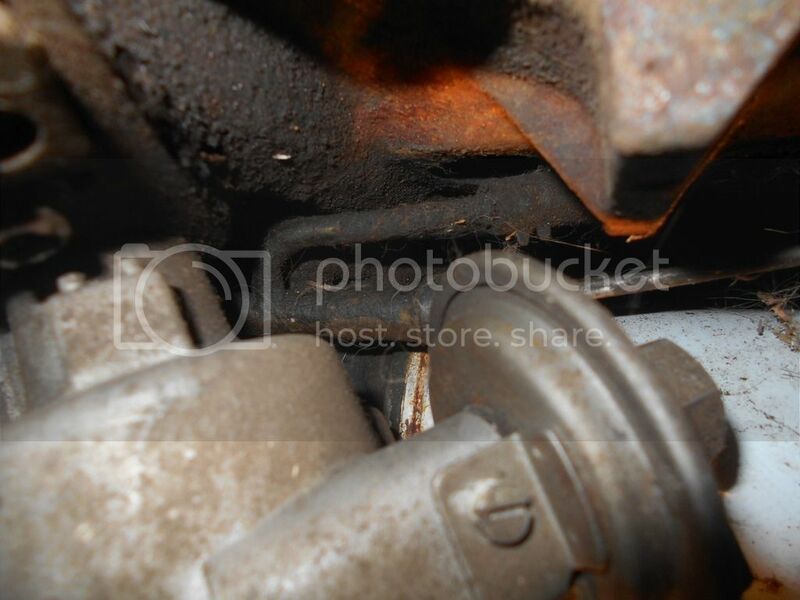 Is that barbed tube coming out of the engine block casting or the oil filter adapter casting? Neither, it actually comes out of the side of the oil dipstick tube itself, it's very hard to get a good photo of. Are J15 motors mostly used in fork truck/industrial applications? It's obviously a drain-back to the oil sump for a smaller amount of oil. Motorpower.com may be able may be able to shed some light. Maybe I'll call or e-mail them early in the week. Correct. I think in North America J15s were only forklift motors . Thanks difrangia for checking into it. When I was diagnosing my turn signals I noticed the rubber boots where the clutch and brake pedals go through the firewall are both wet with brake fluid. Is this the part I need to make the repair? Not sure. if the original single circuit master is 3/4" diameter, but if so, it'll probably work for a rebuild. I have one or two used originals but they are not at hand at the moment. I have a dual circuit master from a late 620 on our 320. To use the 620 master on the 320 pickup, you'll need to elongate the mounting holes on the master. and open up the hole in the cowl that the brake rod boot transits through the cowl through. Don't remember about the operating rod. You might use the rod out of the 320 cylinder?? There is no dual master brake cylinder that bolts right in that I know of, but you need to keep in mind what you plan to do in the future on the truck, as most dual masters are either front disc/rear drum, or disc/disc except for maybe the early 620 which could possibly have Drum/drum power brakes, I don't know this for sure, it might have been drum all around single reservoir power brakes. So the difference between the 320 master you have now and a dual circuit master is the hole in the firewall has to be slightly bigger, so you will have to ream it out a little, but if you were to ever go back to stock the stock master will cover the larger hole, so no one would ever know the hole is bigger, the second difference is the mount bolts on the firewall are closer together on the 320 than the 620/240/260/280Z dual reservoir masters, what I did was oval the hole on the brake master to fit, but this means if the master don't work, you cannot take it back. Here's mine in LHD form. Also used a 620 clutch master. Can't remember if the mounting holes had to be elongated on the clutch master but the cowl hole worked without mods. Used the 320 clutch operating rod. Had to use a round plastic reservoir on the circuit in order to use the original air filter housing like the one on the clutch but a little taller. Should have stated that I used a round reservoir on the front position and rectangular on the back position. 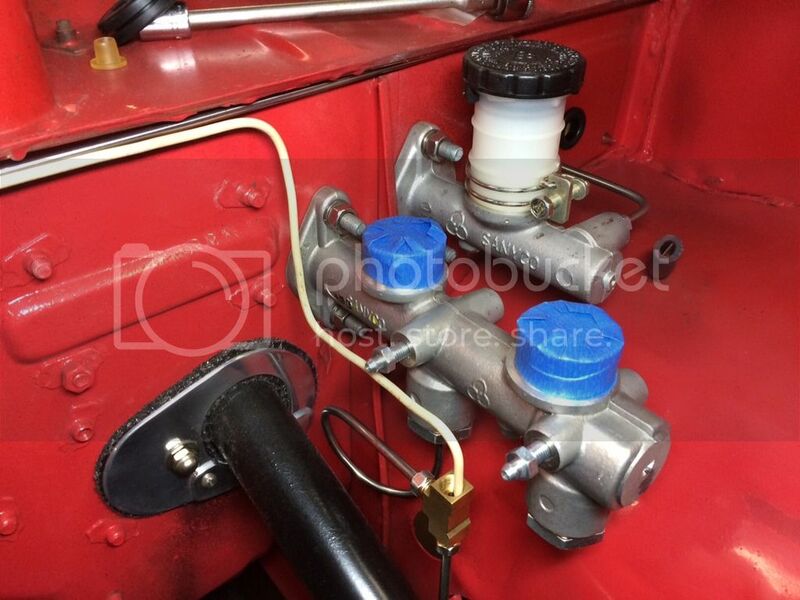 The front reservoir is actually for the rear brakes and the rear reservoir is for the front brakes. I've been driving the truck like crazy and it runs/drives good but it's an SOB to start cold first thing in the morning. And by cold I mean Tucson cold, +-50 degrees. I have to shoot a little carb cleaner into the carb to get it fire. Then for the rest of the day it starts up first crank. Could it be a timing issue? It doesn't backfire, ping, or miss. It does idle a little high though but maybe I need to adjust the carb. Any thoughts what my problem might be?